Learn Ayurveda from the comfort of your home! With us you find the only Ayurveda distance learning course in the German language, which specifically qualifies you as a health advisor in connection with an Ayurveda practical course. Our distance learning course is recognised by leading German and international Ayurveda institutes. Born in Stuttgart in 1983, Devadas began meditating at the age of ten and has been interested in naturopathy since his youth. After graduating from high school (2003), the Bhakti Yoga Way inspired him deeply and shaped his life from then on. He then lived for two years in Krishna temples and made five pilgrimage and study trips to India. In 2006 Devadas graduated from the Vedic Academy under the direction of Reinhart Schacker and completed an Ayurveda internship in India. In the following years he carried out Ayurveda health consultations, as well as Ayurveda seminars and completed further training as a yoga teacher (2009), meditation teacher (2010) and certified psychological Ayurveda consultant (2012). Since January 2010 he is in charge of Ayurveda distance learning at the Vedic Academy. A passionate mantra musician, Devadas has released several CDs to date. He is also the author of a book and gives various yoga and mantra seminars. The basic course should enable you to understand the interaction of the bioenergies Kapha, Pitta and Vata as well as to recognize the Ayurvedic constitution of a patient and to give advice on the harmonization of bioenergies and the constitution. This includes advice on health, such as nutrition, color theory, favorable time qualities and advice on life situations, such as career choice, place of residence and partnership. The advanced course gives you the opportunity to recognize bioenergy disorders and the resulting diseases and to recommend treatment methods of Ayurvedic medicine. These include, for example, medicinal herbs, oil cures or oil massages and pancha karma therapy as well as methods for mental/emotional strengthening and harmonisation. The Ayurveda internship serves to enrich your acquired knowledge with practical experiences. The internship should last at least 5 days or 30 hours. You can divide this period according to your individual needs, e.g. you can do one day per week for 5 weeks, or 10 days for 3 hours each. You are also free to choose your internship position – however, we will provide you with a guide with tips in the study documents, which also contains a list of possible internships that you can use if required. Finally, you write a 5 to 10 page report and send it to the head of the study to review. In this way you can complete the practical part of the training as an Ayurveda health advisor in a very individual and flexible way. The Ayurveda distance learning course of the Vedic Academy offers you maximum individual flexibility and freedom. After successful completion of the complete course you will receive a final diploma of the Vedic Academy as proof of your achievements and acquired knowledge. the attributes (Gunas) for the assessment of Mahabhutas and Doshas and their role for bodily functions. Ayurveda distinguishes three types of constitution: Vata, Pitta and Kapha as well as mixed types. In this lesson you will learn and evaluate the different characteristics of a Vata, Pitta or Kapha type so that you can also conduct consultations. This lesson also deals with the mental constitution of man, the three manifestations of the mind (trigunas) and their effects on the body. suitable leisure activities and compensatory measures for Kapha, Pitta and Vata types. the path of religious devotion to God (Bhakti Yoga). In chapter 5 the 8-fold yoga path (Astanga Yoga) with its 8 levels is described and explained in detail in both theory and practice. These include level 3 physical exercises (asanas), level 4 breathing exercises (pranayama), levels 5 – 8 Raja Yoga, mental training, concentration, meditation and letting go. The effect of the various breathing exercises and asanas on the body and constitution is also described. This lesson is rounded off with a summary of eating culture and Ayurvedic dietary rules. While the basic studies deal with the basic knowledge of Ayurveda, the lessons of the main part deal with Ayurvedic diagnosis and therapy. Examination and diagnosis of the patient (pariksha), e.g. examination of the pulse, eyes, tongue, skin, excretions, etc. exposure to digestive slag (ama) and contamination of the doshas with ama. assignment of medicinal plants according to organs and functions. Pancha Karma, detoxification procedure: vomiting (Vamana), laxation (Virecana), enema (Vasti), treatment through the nose (Nasya) and bloodletting (Rakta Moksha). strengthening and rejuvenating measures (Rasayana), e.g. through nutrition, medicinal herbs, minerals, yoga asanas etc. treatment tips for simple illnesses that anyone can use in everyday life. Marma therapy, treatment of the body through the marma points. This main part of the distance learning course is not specifically aimed at doctors or alternative practitioners. The lessons are written in such a way that they can be understood and applied by everyone. Therefore, no previous medical knowledge is required and it is also pointed out which therapies belong in the hands of a doctor, although the knowledge about these therapies is interesting for all students. When booking this distance learning course, it is possible to redeem a bonus voucher from the Education Award Programme of the Federal Ministry of Education and Research (Bundesministerium für Bildung und Forschung). In this case you can apply for a grant of up to 500,- €. Please note that the award voucher must be issued before registering for distance learning. Otherwise it will not be redeemed by the issuing institution and the full seminar fee will be due. Further information can be found at www.bildungspraemie.info. 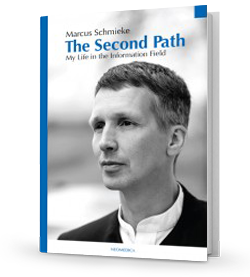 Marcus Schmieke is a philosopher, scientist, inventor and entrepreneur. This book describes, in his own words, his achievements so far and most everything he has seen, realized and been gifted with in his inner and outer world. 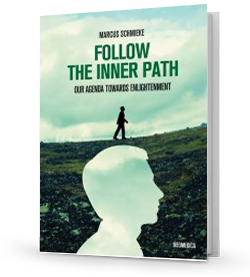 The core assumption of this book is the transformation of every human being during his or her lifetime: the transition from the material to the spiritual phase, the “Second Path” that often comes with painful changes and experiences. The all-encompassing Information Field and its practical applications are the tools and the pivot of a story that will leave many readers incredulous or in awe, but all with new ideas and a substantially altered outlook on life, the universe and everything. This book is about The Four Pillars of the Inner Path. It guides the reader on his or her way to dissolving the disruption within themselves, this being the prerequisite for dissolving the disruption in the outer world. Other central points of the plot are the tension between mind, matter and self, the secrets of life and death and a detailed description of the levels of our consciousness. From a fascinating and novel perspective, the author recounts the legend of the Holy Grail and Parsifal in a compelling way, the history of the Golden Age of science, from the very beginnings of quantum physics and modern psychology until the dropping of the first atomic bomb. An entire chapter is dedicated to discovering the functions of our consciousness, leading to a strikingly detailed description of the reader’s own personality.